The IOHA Cup format has changed since last year… From a round robin tournament to knock-out tournament. This Cup is going to be played over two weekend: a first group phase of 30 mins games and a final stage with full time semi finals on the Saturday and final on the Sunday. DIHC has engaged 3 teams in the competition this year. 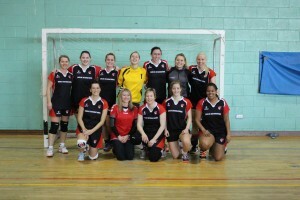 The usual Ladies team had to battle against Astra HC, UCD and the newly formed UCC women team. The usual man team – DI M1 – had to race with UCD 2, DCH & Sligo IT. 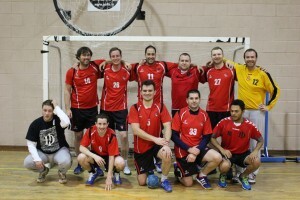 A second man team – DI M2 (the older players…) – also played against Astra HC, UCD and UCC. The young DI players took this competition very seriously from the first minute on the pitch. Started against the recently formed second squad of the UCD club – our boys quickly made it look easy and win the game 25-3. Note a very balanced scoresheet on the DI side – 3 goals for Petersen, Busuioc, Seselj, Daec, Golban, Milian and Feuerstein and 4 goals from Janusauskas. First win of the weekend for DI. Second game was against the well known opponent – DCH. DI will one more time start game in total confidence and get into a comfortable 5 points lead very quickly. DCH has a hard task to accomplish in such a short game (30 mins)… DI’s line player – Seselj – finishes the game with 5 goals while both back players – Goretti and Janusauskas – get 3 each. DI’s keeper – Magnani – completes a great game with 9 saves to give DI a good victory 17 to 9. The last game was against Sligo IT. With built up confidence on the DI side, the winger – Soyer – got to be the top striker in the game with 5 goals. Closely followed the Danish centre player – Petersen – who gets 4 goals. Note that the other winger Busuioc also got 4 goals. The referee will call it done at 24-6. Great tournament for the guys who assured their spot in the Semi finals. Early start for all of us… Our ladies start the day against UCD. Straight in the game – DI leads very quickly by 4 points. The back line Jaffuel & Le Guen well helped by the winger – Joly – add points to sheet while the keeper – Vuskane – does not let much in… Unfortunately the back player – Bufflier – will stop on injuries for the day. DIHC will start with a victory 20 to 6. Last but surely not least our ladies had to play Astra HC. Good start – after a few minutes DI was leading 5 to 3. From there our ladies accumulated a few 2 minute penalties… However they manage to stay in the lead and come full squad still 2 points in the lead – 7 to 5. DIHC has then closed the defence and keeper Vuskane built a wall behind her! Final score 14 to 5. 3 clear wins for our Ladies – great job. Ready for the finals… Bad news of the weekend though is that our back player – Roxanne Jaffuel – will leave us to continue her discovery of the world, on the behalf of the DI squad we wish her all the best and we will miss her. It was now the turn of the older lads to show how DI did it in the past! A few players made a come back for the occasion… First game – early morning – was against UCD. Sure the two back players – Sefroun and Romanowsky – do remember how to jump and shoot. The line player – Martinonis – also remembers very well how to play with the 2 hitters… Very quickly DIHC gets the lead and stays ahead till the end of the game. First victory in hand 13 to 9. Second match – our older lads get to put their legs back in movement… and it worked. Quickly in the lead after an opening goal from captain line player Martinonis. But efforts of good defence UCC pushed our big shooters to the fault. However with good help from Bihan on the wing DI2 stays in the lead to close the game at 13 – 9. The last game was against a well known opponent – Astra HC. Some sort of a deja vu as the players from south Dublin had won this same game the year before in the round robin tournament. The game does not flow very well for both teams – 3rd game of day – difficult to get moving quickly. For most of the game the score is very balanced and we can see a draw coming our way… After a time out for DIHC – the defence seems to work a little better and the attack gets to conclude. DI gets 2 points in the lead with a minute or so to play. Astra tries to defend high – but fortunately it does not work and DI2 closes at 13 – 11. Also heading towards the finals! Summary: 9 games – 9 victories! Incredible performance from DIHC – this was probably the best weekend of handball DI has ever had! Great participation from all members – Thank you to all the supporters! Access the DIHC Photo Book!